This impressive new house needed a garden to complement its modernist style and to connect it to the landscape beyond. With qualities reminiscent of the Mies van der Rohe Barcelona pavilion, the building’s strong, clean lines, projecting walls and ‘floating’ canopies provided rich material to use in the garden design.The main entrance to the house was made more dramatic with a waterfall that dropped from the extended roof-line, down a metal mesh screen to feed a long pool running the length of the house façade. Small courtyards leading off the bedrooms were minimalist in style with single trees, gravel, stone plinths and sculpture, while a second waterwall feature, acted as a focal point for views through the long central axis of the house. Other elements included an outdoor kitchen, tropical garden and a tree house, designed to reflect the modernist style of the house. 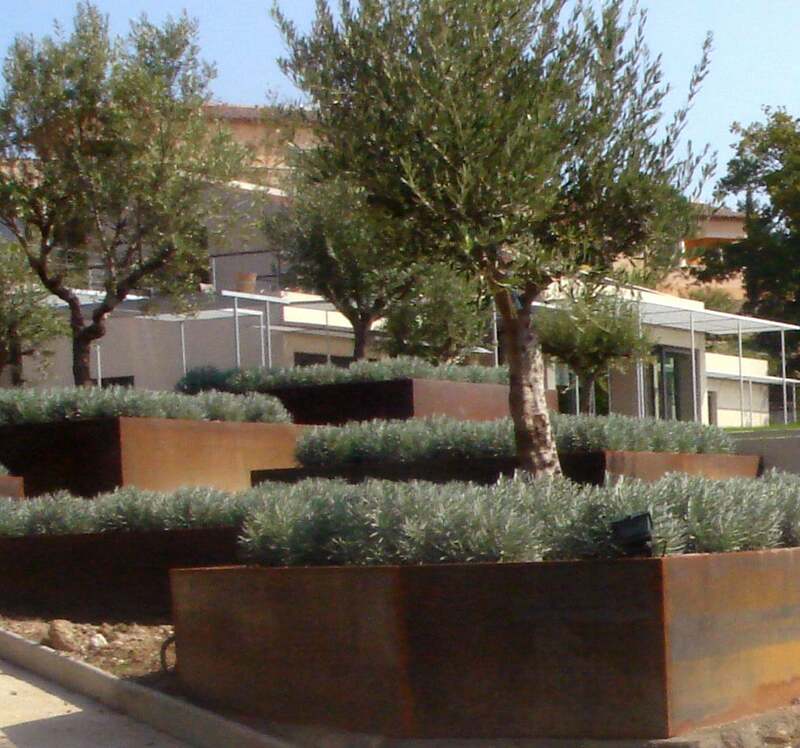 A series of large, square Cor-ten steel planters with mature olive trees and lavender were cut into the hillside, to follow the natural fall of the land and to screen the drive approach from the main gate to the house.